All students must register with PCM and pay a yearly registration fee of $40. This one-time (non-refundable) fee covers the entire academic year, including summer, and allows students to take any number of private lessons and/or group classes, as well as free master classes and other special offerings. Fall and spring semesters are 16 weeks each. All private lessons at PCM must be paid for in advance. Students are expected to register for a full 16 weeks. However, alternative schedules may be arranged directly with your instructor. Once you have confirmed your semester schedule with your instructor, payments can be made in full or via a payment plan. To set up a payment plan, please contact the PCM registrar. By registering and paying for private lessons, students commit to a consistent schedule with their instructor. As such, students are expected to attend all scheduled lessons and to give as much notice as possible when a cancellation is necessary. All students are entitled to one excused absence (requiring 24 hour notice) per semester to be made up free of charge. We specifically designate a Make-Up Week at the end of the semester for this purpose. Any additional lessons missed by the student will not be made up or reimbursed, except at the discretion of the instructor. All lessons cancelled with less than 24 hours notice will be considered unexcused and will be charged. If PCM closes due to inclement weather, an announcement will be made via email and/or posted on PCM’s website. All private lessons missed because of a PCM closure or an instructor’s absence will be made up free of charge. If the instructor is not able to teach all paid lessons during the semester, remaining lessons will be credited to the student’s account. For students who do not plan to continue, a tuition refund will be issued for all unused lessons. PCM offers a multiple family member discount on private lessons (but not for group classes). If more than one person in an immediate family is taking private lessons at PCM, the second student in the family receives a 5% discount on private lesson tuition. The third and any additional family members receive a 10% discount. PCM tuition may be paid by checks, cash, or credit card. One credit card payment per semester is processed for free, but additional payments will incur a fee of $5 per transaction to cover PCM’s additional cost. Students who wish to withdraw from lessons and receive a refund for the remaining tuition may do so by the 4th lesson, however, no refunds will be given after the 4th paid lesson of that semester. There are no refunds for Group Classes. 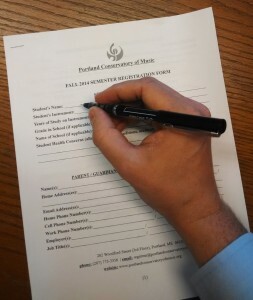 Portland Conservatory of Music charges a fee of $25.00 for every returned check. Children under the age of 16 must not be left unattended while at PCM. As a benefit to our students, PCM studios may be used for up to two hours at a time for private practice and/or rehearsals; however, reservations must be made in advance by emailing PCM. All students under the age of 16 must be accompanied by a parent or guardian during scheduled private practice and rehearsal times. During registration, students or parental guardians will be asked to give permission for PCM to use photos, videos, and/or audio recordings of the registered student. These materials will be used solely for PCM’s promotional and fundraising purposes. You may opt-out of this when registering, if you prefer.